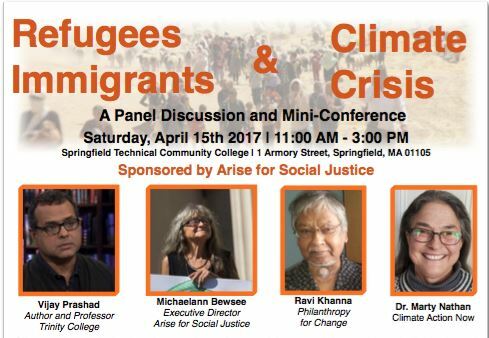 A panel of experts and activists on the connections between war, climate disasters and refugees, health impacts on immigrants, climate justice locally, and examples of activist organizing. Climate change is fueling the growing refugee crisis around the world, as individuals and entire communities are forced to flee their homes due to its effects. Come explore humanitarian implications as well as questions of responsibility and justice at the international, national and local level, and afterwards participate in workshops to understand how you can make an impact. (4) Ravi Khanna, philanthropic advisor at Philanthropy for Change. (3) Health Impacts of Climate Change, led by Sarita Hudson (Partners for Healthier Community). Free parking at Pearl St. lot. Follow signs to Scibelli Hall.